Jewish artifacts, including ancient Torah scrolls from synagogue in Damascus have gone missing amid the tumult of the ongoing civil war. Jewish artifacts, including ancient Torah scrolls from one of the world's oldest synagogues, have gone missing from the Syrian capital amid the tumult of the ongoing civil war, The Associated Press reported on Sunday. 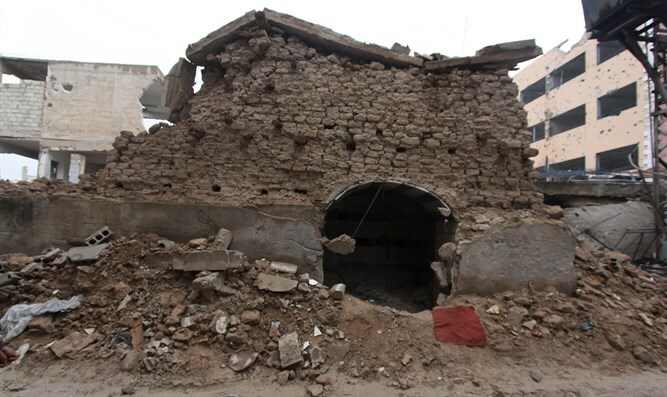 Activists say the artifacts, moved from the now-destroyed Jobar Synagogue in Damascus' eastern Ghouta suburb when it was taken by rebels, were allegedly put into safe keeping to avoid theft and damage in 2013, but twice since then local officials have discovered some are missing. The main missing cache, they say, contained Torah scrolls written on gazelle leather as well as tapestries and chandeliers, and was given to a militia by a local council for safekeeping when rebels surrendered the neighborhood to government forces earlier this year. That group, the Islamist-inspired Failaq al-Rahman brigade, later said that it was not in possession of the items after the council arrived at a new rebel base in Syria's north after evacuating earlier this year, according to AP. The synagogue, also known as Eliyahu Hanavi, is one of the few Jewish places of worship in Syria that was functioning until shortly before the civil war began in March 2011. An activist who goes by the name of Hassan al-Dimashqi told AP that for months after rebels seized the neighborhood in 2013, the synagogue was protected by the main local force in Jobar, known at the time as the Haroun al-Rashid Brigade. The synagogue was said to have been mostly destroyed in mortar attacks during a May 2014 battle between troops loyal to Syrian President Bashar Al-Assad and rebel troops. The synagogue reportedly was looted following the battle. The whereabouts of the items entrusted with Failaq al-Rahman have not been verified, although al-Dimashqi and the Britain-based Syrian Observatory for Human Rights say some of the pieces, including carpets, chandeliers and historical scripts, have surfaced in Turkey. Syria recently filed a complaint with the United Nations Security Council in which it accused Israel of stealing ancient and valuable Jewish artifacts from the Jobar synagogue in cooperation with Turkey and with terrorist groups operating in the area. In 2011 there were about 50 Jews still living within Syria, mostly in Damascus. By May of 2012, only 22 Jews were left in Syria. In September 2016 the number was reported to be down to only 18. In addition to Damascus, there was once a large Jewish community in Aleppo. After the last known Jewish family was smuggled out of Aleppo in a dramatic operation in 2015, the synagogue in the city stood as a lone remnant to the Jewish life in the city, which dates back to 12th century CE. The Aleppo synagogue was in danger of being destroyed in 2016 as regime forces moved in on rebel strongholds in the city.